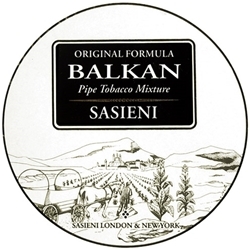 Created in London around the turn of the century, Balkan Pipe Tobacco consist of a perfect mixture of ribbon cut Macedonia and Latakia tobacco leaves. This high quality pipe tobacco produces a cool burning well rounded smoke that starts with the Orientals up front, melds in the middle, and finishes a little stouter with ash at the end. For decades, pipe tobacco connoisseurs have loved Balkan Pipe Tobacco for its perfect moisture levels, a perfect burn, and very smooth and mild taste. Here at Smokers Discounts we offer you a great way to relax and enjoy a great quality smoke at an inexpensive price. Balkan Pipe Tobacco is an excellent choice for your pipe smoking needs. Our online tobacco store was created to make it easy and affordable to buy pipe tobacco online. Call us for more details!